SEO is a long term strategy. If you are in it for the short term don’t even bother. Because it’s the foundation of your entire digital marketing, SEO needs to be implemented methodically and organically. This is the only way Google will ever end up ranking your website. Promises of speedy fast churn n burn rankings are for suckers who believe this spin and the only outcome is a Google penalty. Having said all that there are things you can do to speed up the SEO rankings by implementing certain ‘on page’ considerations before you commence your link building. If you start early and get these done properly this will have a significant impact on how Google reads and ranks your web site. Obviously all of this takes time but believe me when I tell you it’s well worth spending more upfront on your SEO to make sure that your site is 100% compliant. Basically you need to allocate a larger slice of your SEO budget at the beginning to kick start your campaign. 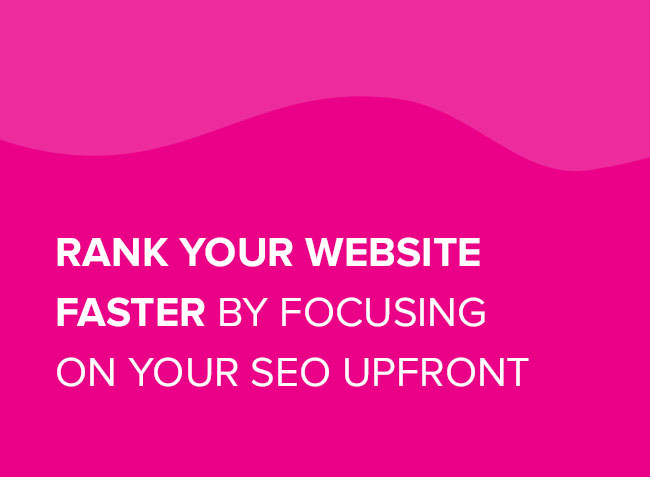 This is assuming that you have some more money to throw at your SEO – remember a lot of companies we work with have really poor rankings because they have completely ignored a raft of ‘on page’ issues and then we have to come in and clean things up. This is part of our SEO strategy but with it comes a cost to clean the mess up created by past SEO agencies. So many so called SEO providors will claim to do the right thing by you but will in fact hurt your online digital profile by simply back linking without paying any attention to the actual website itself. This is harmful, dangerous and unfortunately is common practice. They do this because they want to offer you cheap SEO and in turn you end up paying the price because they will neglect the fundamentals that constitute SEO. This is not how we work. When we start an SEO campaign we make sure we tick all the boxes from day 1 to make sure your site is 100% compliant. Following are some techniques we implement to make sure your SEO campaign has the greatest chance of succeeding from the get go. Has your website ever been audited in the past to test it for it’s Google compliance? If not , then it needs to be. Many websites that were designed and built over 2-3 years ago don’t pass Google’s strict ranking algorithm and are therefore hampering any SEO efforts. No matter what SEO work is undertaken if an audit has not been done to fix glaring on page issues, then the ranking results will be poor. That is, you are never going to attain the kind of results you expect. If you dream of being up there on page 1 of Google, then you better get your website audited. Sure you may think your website looks great and there’s nothing wrong with it, but all you need to do is scratch beneath the surface and an audit can discover heaps of issues. Duplicate content throughout the site or plagiarised pages from other sites. Once we gain access to your WMT we can see all the links that are pointing to your site and prune any toxic or ‘spammy’ links. Pages that do not lead consumers down the buying funnel. As you can see from the above there are heaps of things that could be wrong with your site and that need to be attended to before any one can expect reasonable rankings. Once we have identified these issues it’s important that we get onto these early and start fixing the problems as soon as possible. This means that a portion of your marketing or SEO budget needs to be set aside for this kind of emergency. Basically investing money into fixing these issues is a good thing once you see the impact it can and will have on your rankings. The cost comes in when a developer is involved and your website needs some serious coding work done. This is more common that you expect as so many sites were built using dodgy out dated coding techniques – I also want to add the scores of websites that have been built using free templates like WIX and Square Space , even WordPress free themes. The ‘on page’ SEO issues with these free sites are incredible and In a lot of cases we have to completely ditch the free site and start again – PEOPLE who are reading this if I can make 1 point stand out – that is – these FREE WEBSITES ARE SERIOUSLY BAD FOR SEO – avoid them at all costs – they will kill your Google rankings. Let’s be very clear here; the main aim of any SEO campaign is to get more sales leads and drive revenue. If your website is on Google you will get the inquiries, simple as that. But, to get there means that your on page message ( that is, what your website is saying), must be clear and have a strong core message. When a potential customer lands on your website they need to find what they are looking for very quickly. Delays in finding a product or service can lead to website abandonment. Also, the keywords that the SEO company is targeting must be correct – no point ranking for words that are irrelevant to your business. So from the beginning, you need to do a thorough keyword research and determine the words that have the highest amount of targeted traffic. So a combination of clear on page messaging ( through a website audit) combined with core keyword analysis will ensure your website, once ranked, gets the right type of customer. Let me explain this in a bit more detail as these points are very important to understand. Keyword research is seriously important and is vital for the success on any SEO campaign. You have to set aside time to know what your customers are searching for on Google and see if there are any other appropriate keywords that have a decent amount of traffic. We have a number of tools at our disposal for this type of research such as keyword planner and Google trends. Once identified we can match these keywords up with the relevant pages on your website and then push the ‘go button’. At SEO Sydney Experts we make sure we get it right from the beginning and get all our ducks lined up in a row before we start are SEO campaign – this is why all of our clients have fantastic rankings. Please ask me about these and I would be more than happy to share this information with you. What is your Target Market & what is your Competitor doing? We need to work out your target market, what they are doing online and also look at your competition in this space and see how they have been able to rank their site. Working out what your competitors are doing is only half the battle, outranking them is the tricky part, but lucky for us we know how to do this effectively and for the long term. We will work out exactly what your competition is doing, how they have managed to rank themselves and then devise a strategy to out perform them. All this is done at the planning stages of your SEO campaign and this is why there needs to be a certain budget allocated for this type of research. I know many people might say that this should be part of the overall SEO campaign and included in the monthly fee but many agencies will either slug you hard for this service or do nothing at all – either way you loose. Analyse the current content of each page and make sure that it is relevant and on topic to that page – you cannot have too many mixed messages on 1 page. For example if you are an electrician in Sydney and one of your service pages you are trying to rank for is: ‘commercial electrical repairs’, then the content for that page needs to be all about commercial electrical repairs and nothing else. Waffle and mixed messages will confuse Google and hamper the ranking of that page. Our job is to keep you on message. Also read: Is quality content good for SEO rankings? Identifying the target audience and write copy specifically for that market. Not point writing copy that appeals to Gen X if your market is for the over 60’s. We look at what your competitor’s content is and make sure that yours is far better and more engaging. We prioritise pages on your website that have poor or little copy and get it rewritten for you. We look at your content marketing strategy such as blogging and make sure that you are up to date with this – if you have been slack with your blogging/article writing then we make sure that this part of your digital marketing is put back on track. Being active in this space is a vital component of Google’s latest algorithmic update known as ‘Rank Brain’ – steady copy writing is now a must do activity and we can really help you in this part of you overall SEO campaign. THE GOOD NEWS IS THAT AT SEO SYDNEY EXPERTS – we will not charge you for this research and upfront analysis and make it part of our SEO service to you. This is a massive win for small businesses wanting to rank on Google but do not necessarily have the deep pockets to pay for the extra services that are needed. The point I am really tryng to make here is that you can speed up your rankings only if you are prepared to work with an agency that knows the fundamentals of SEO and one that can implement all these on site changes effectively. If you do it right from the beginning (we love to do it this way) you should see an immediate improvement in your rankings. Next Next: Why should you trust us with your SEO campaign?